Property 22: Holidays in the Saale-Unstrut valley with a unique view. Property 40: Fewo Bienwald Nr. 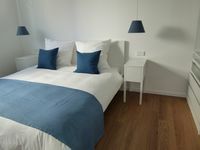 1 with 43 m² ,, friendly and just to feel good "
The accommodation was look like a hotel, very clean! Beautiful modern House. Very friendly family and great help with anything you need. House was very spacious, felt very safe. A warm welcome and good local house, I really love this house and this family and also very happy with my stay in here, Thank you for everything!! !